I’ve seen nearly every silent film Charlie Chaplin appeared in, from Making a Living (1914) right through to Modern Times (1936). 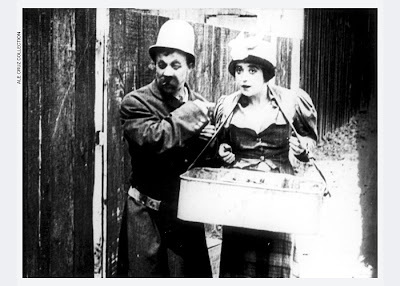 So when I tell you that Mabel’s Busy Day is one of the strangest Chaplin films there is, I do so with some authority. It isn’t just Chaplin’s film. It belongs equally to Mabel Normand, Keystone Studio’s biggest female star; a gifted comic in her own right, as well as a director. 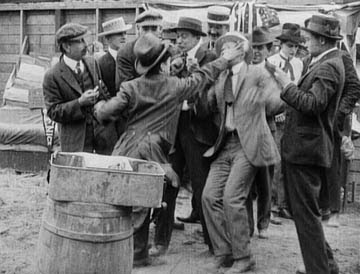 Normand may have directed herself in this film; or it was Keystone boss Mack Sennett who did it—my sources dispute this. But whoever’s responsible created something memorably strange. Surreal, in fact, in a way Chaplin rarely was, even once his growing creative control let him try anything he wanted. Mabel’s Busy Day is a short, set at a racecar track. The fact that cars are racing is totally irrelevant; what matters is that the race has drawn a crowd, and a rowdy one, held in by a wooden fence. Outside the fence is Mabel, a woman selling sausage dogs. She wears a big tin drum slung over her neck, holding the links in one side and buns and mustard in the other. It looks like a washbasin. Mabel’s not making much cash outside the fence, so she bribes a Keystone Kop to let her inside, where the mob is. It turns out the mob is mostly male, and drunk, and maybe, Mabel’s not prepared to deal with that. Early silent actresses tended to have a defining trait that informed their on-screen-persona. Mary Pickford’s was often aggression; she faced situations with her fists-up, though behind this a soft heart lay. Lillian Gish was almost the reverse. Normand’s essential quality, I think, was appearing overwhelmed. She could lash out, as she does in this film, but her punches lacked the authority of a Pickford smack. Those big, mournful eyes of hers gave it away—she was a gentle soul, terrified of a world too big for her. Her character was, anyway. In Mabel’s Busy Day, the heroine is quickly and repeatedly loomed over by loutish men. They grin and steal her food without paying. She slugs one down, but mostly she’s abused by them, and we’re soon conscious—in a way that makes us uncomfortable—of the presence of the crowd. It is always a little close. It is watching her. Mabel’s seems almost to be onstage. The film’s main action takes place in and around a wide semi-circle of dirt, ringed by these people, and I don’t know what purpose such a space would serve at a racetrack, but in this film, it makes a very good gladiatorial pit. And where’s Chaplin been all this time? Like Mabel, he wants to enter the track area without paying, but his method is cruder: he just assaults a Kop and bypasses the line. I don’t think Chaplin is the Tramp in this film. His clothes look too new. Then again, the coat and the shoes are too big, so this is not his tipsy millionaire character either. Nor is it his blue-collar working man. It is some strange mix: a drunk, apparently wearing someone else’s nice clothes, attending a populist event and acting a lot like the Tramp. How does that sound to you? Watching him here, it occurred to me how much of our tolerance for the Tramp’s behavior rests upon our acceptance that he’s a desperate man. He picks pockets and steals food because he’s broke and starving. He flirts with women above his station because he’s lonely—and really, almost every woman is above his station anyway. But take away the obvious symbols of his poverty—the clothes—and isn’t he just a nut? Or something worse? 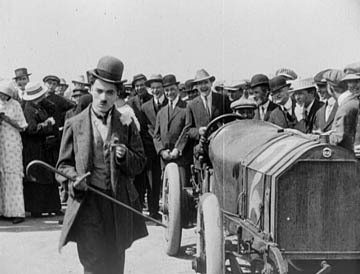 Like Normand, Chaplin performs here for an audience within the film, as well as for us. Watch the sequence in which he confuses one of Normand’s discarded links for a cigar: it’s odd, to us, to see a man who is not a bum picking up food off the ground—but it’s also odd to the people in the film. At least half the crowd is watching him, big grins on their faces. They’re either cruel or post-modern (and Keystone films were occasionally both). Even Chaplin’s movement is warped. His second run-in with a Kop is more of a dance than a fight—and when you read this, understand that I’m describing a fight that, within the context of a film, is very much a fight, but often looks like a dance; I’m not describing a balletic fight scene. Not just the dropkicks, haymakers, tumbles and rolls of a typical Chaplin brawl. I mean a duet of footsteps, with coordinated spins. Soon after, Chaplin happens across a bigger Kop, and tips his hat to him. Then he circles him, and does it again. And again—the behavior is compulsive; robotic. More importantly, it isn’t efficient. The true Tramp’s behavior was often strange, but it always had its own logic, and was designed to achieve a goal with minimal expense of time or resources. This sequence does the opposite. I can’t compare it to anything Chaplin did before or since, except possibly his Mutual-era short, The Rink (1916). Even that one isn’t much the same. Always the crowd hangs around; observes; looking a little hungry as they do it. I’m not giving away much when I tell you that the crowd gets theirs—a little bit of retribution from Mabel and Charlie, anyway. But what is the message? Don’t tell me Chaplin and Normand and Sennett didn’t have one. They’re saying something about audiences here, even if this is a Keystone comedy, and even if the crowd was, in part, a real crowd of non-actors. When talented comics and directors make a dark comedy about an audience that breathes down performers’ necks—an audience of fickle, shallow, mocking people; tasteless and thieving and cheap, well… it must have felt good, at the end of a long week, to play that reel. Mabel’s Busy Day can be found on Disc Two of Flicker Alley’s fantastic four-disc set, Chaplin at Keystone. It sounds like the idea was to let Chaplin & Normand loose in a crowd at an event and see what happens. Involving what, per your description, is a real, non-actor crowd, it does make the film seem like post-modern docu-drama; or maybe it's an anticipation of improv cinema, a la John Cassavetes? Supposedly Keystone did this a lot. It was less an artistic choice than a financial one, since it allowed them to have crowd scenes without paying for a crowd of extras. However, I don't know if MABEL'S BUSY DAY is an example of the practice. 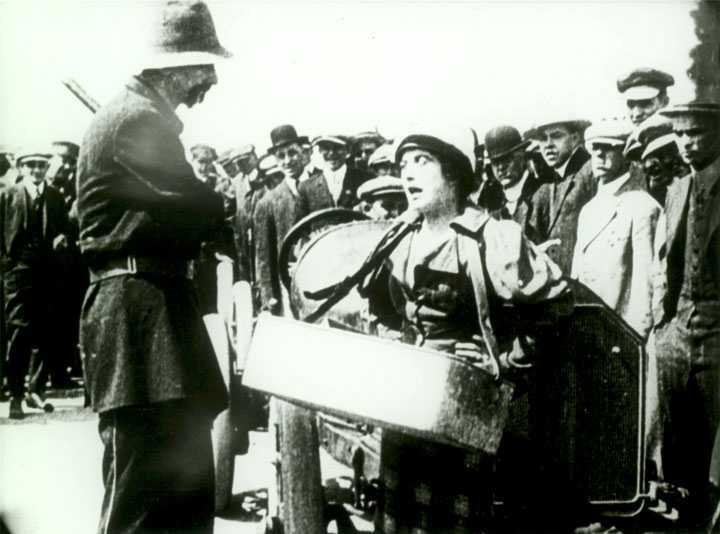 The scenes in which members of the crowd interact with Mabel or Chaplin obviously involve actors--and in those cases, usually, it's only a small cluster of men or women. The one shot which makes me suspect they're shooting on location (aside from wide shots of the car-race, which could have been filmed anytime) is Chaplin's bit with the cigar and the sausage. Half the crowd surrounding him is watching him, and they look like people amused at having a clown performing for them. On the other hand, half the crowd has their backs turned. No easy explanations here.